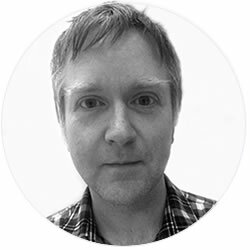 The Talking Llama – Beacons, Mobile, Web Apps, Tech. The biggest problem we have had with the Recording Britain exhibition was that of being able to determine which beacon is actually the closest to the user. The exhibition is in a single room, with very little separation between areas. We found we would often be detecting a beacon from the other side of the room with equal or greater strength than a beacon much closer to us. This was despite putting various post-processing checks in place to eliminate signal spikes and using averages of readings. It should be noted that many other scenarios would not have this problem – if the beacons are in different rooms, or are sufficiently spaced out then the physical separation would make it much easier to differentiate between beacons. As I have previously commented in an earlier post, the angle at which the beacon faces the phone is very significant. The strongest signal will be detected if the phone is in the same plane as the beacon, and facing it. However this is not usually the way we would hold a phone in a gallery. If beacons were flat against the wall as would typically be the case it would mean we got the strongest signal by holding the phone away from us, parallel to the wall. It would be more usual to hold a phone at an angle of between 0º and 45º to the ground. This is just about the worst possible position to detect the signal from a beacon mounted on a wall in front of you. To resolve this we would recommend mounting the beacons on the ceiling so that the strongest signal is directed downwards (think of a streetlight directing a beam of light onto the road below). In the Recording Britain exhibition the ceiling was too high and so we created simple metal brackets for the beacons. The image above shows a close-up of the bracket, and the one below shows it relative to the exhibits in the Recording Britain exhibition. We ran some tests to explore this theory. The graphs below show readings we made with the beacon at different angles to the measuring phone. 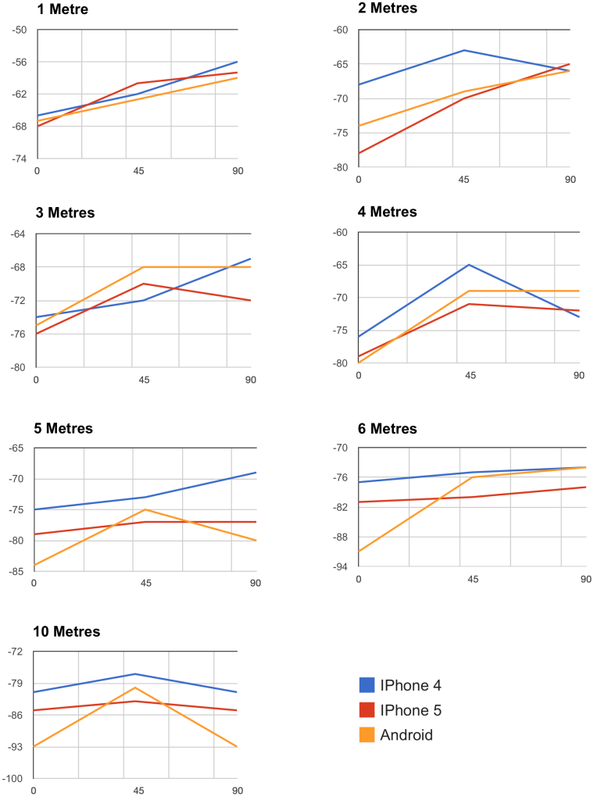 In the tests the phone is horizontal, and placed at varying distances from the beacon: 1m, 2m, 3m, 4m, 5m, 6m and 10m. We took measurements with the beacon at 0º degrees (i.e. flat against the wall), at 45º and 90º. The beacon angle was enabled by mounting the beacon on a simple metal bracket, similar to in the photo above. On the charts the vertical axis is the measured signal strength from the beacon (RSSI). The closer the value is to zero, the stronger the signal. On the horizontal axis it is the angle of the beacon to the wall. We have repeated the measurements for three different phones. As you can see, the closer we get to the beacon the biggest benefit there is to the beacon being mounted at 90º. Once we get beyond 6m or so there is very little difference. We noticed that the power setting of the beacon also has an impact on how well we can judge the distance from the beacon. This was slightly counter-intuitive as it may be presumed that using a lower power setting might make it easier to detect when we are close to the beacon. However, we found that at a higher power setting the difference between the received signal strength at close distance (< 2m) and intermediate distance (>8m) is much more pronounced. The power setting on Estimote beacons ranges from -30 dBm to +4 dBm. We used the maximum setting for our tests, and the beacons in the Recording Britain exhibition are also set to this value. This is unfortunate as this will reduce the beacon battery life. I would recommend using a lower power setting if you are not using multiple beacons in a single small space. Since positioning the beacons on brackets in the Recording Britain exhibition we have experienced much more accurate detection of the nearest beacon. The video below shows a continuous walkthrough of the gallery that demonstrates how well it works. 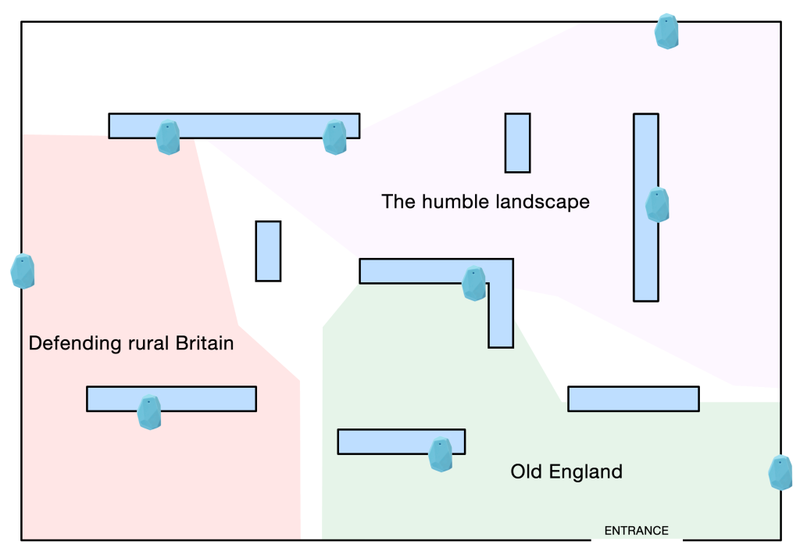 This plan shows the layout of the Recording Britain exhibition in the Millennium Gallery in Sheffield and shows where we have positioned the Estimote beacons. See the previous post for a video walkthrough of the app in use in the gallery. The exhibition is in a single room (approx. 22m x 14m), which contains some temporary (hollow) walls that are about 2m high. These are the blue rectangles marked on the plan. The photos below help give a sense of the scale of the gallery. In our app we detect which zone the user is in and show relevant content for each zone. This presented quite a few challenges. The zones are rather irregular shapes, and there is not much in the way of physical separation between the zones. The temporary walls are wooden with a metal frame and do not provide much shielding from the beacon signals. We have had a couple of goes at positioning the beacons. The end result works pretty well and, as you can see from the plan, consists of three beacons per zone. All are at a height of about 2m and pointing downwards (more of that in a separate post). We would have liked to position the beacons a bit lower than this but the curator was understandably not keen. The beacons are at 4dB power level, which we found was the level that gave optimum differentiation of beacon signals when the user is around 2m from a beacon. 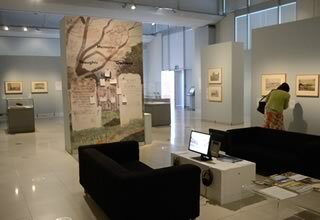 This video demonstrates our iPhone/Android app in the Recording Britain exhibition in the Millennium Gallery in Sheffield. 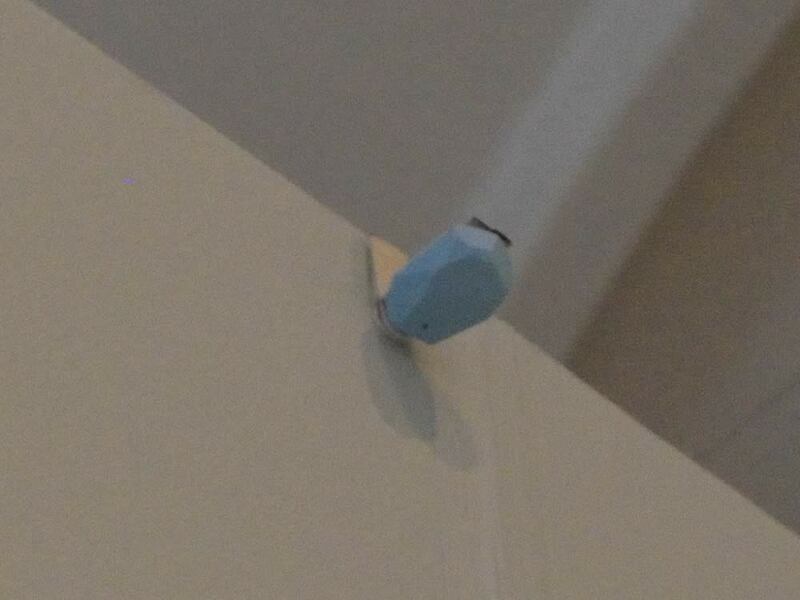 There are Estimote beacons positioned around the gallery and using these the app detects which one of three zones you are located in. The app then presents a selection of content relevant to that zone. The video includes a walkthrough of the gallery, showing how the content changes as you move into different zones. 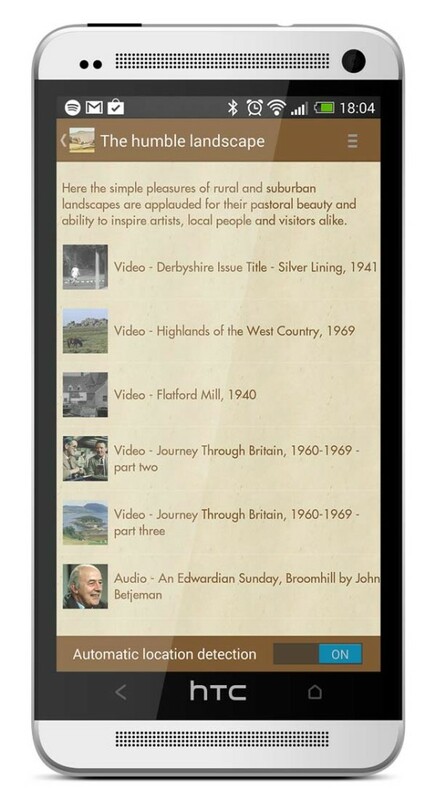 We have now released our Recording Britain app for Android. Find it in the Google Play Store here. It works on a wide range of devices of various sizes, including 7 inch tablets. For devices that don’t support Bluetooth LE the automatic location aspects are disabled and the app can be used in manual mode. For devices that do support Bluetooth LE we use the BLUETOOTH_ADMIN permission to only turn on bluetooth for beacon detection on the screens where it is actually used. This makes the app more power efficient – in particular it does not drain the battery by scanning for beacons when the app is in background mode. 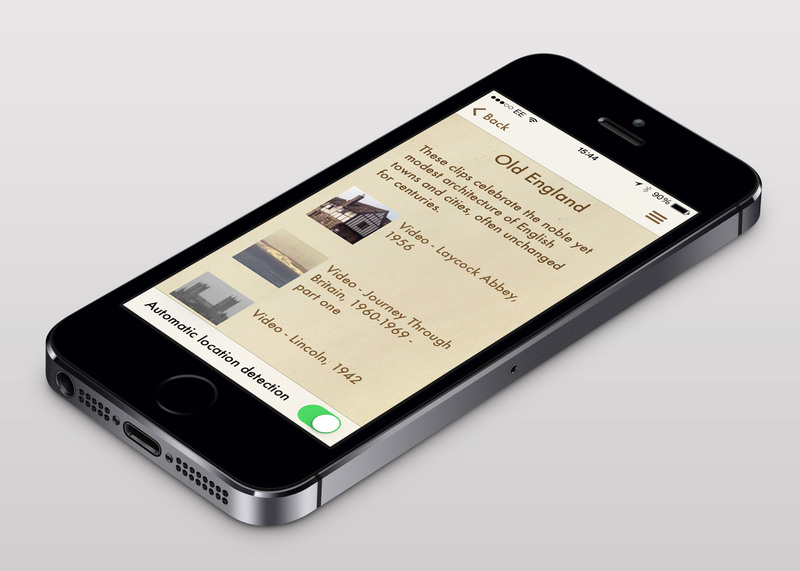 Here’s a sneak preview of our Recording Britain app which accompanies the Recording Britain exhibition organised by the Victoria and Albert Museum, London, showing in the Millennium Gallery in Sheffield from 3rd April to 2nd November 2014. Recording Britain is a remarkable collection of watercolours and drawings depicting the changing face of Britain during the Second World War. 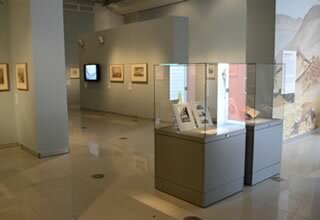 The exhibition features over 70 highlights from the full collection. The app helps convey a sense of what Britain was like at the time the paintings were created. There are wonderful videos from British Pathé and readings of John Betjeman poems. Of course our main interest in doing the app was to showcase iBeacon technology to detect the user’s position within the exhibition and show relevant content. 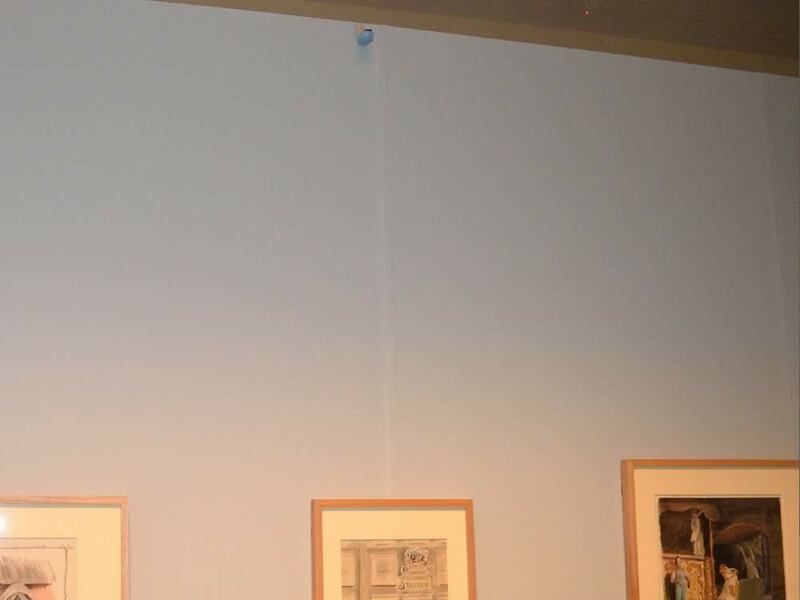 We’ve used seven Estimote beacons around the gallery which will locate the user in one of three zones, each of which has its own set of content. We’re waiting for the app to be approved in the AppStore. We’ll update you when it’s available.